Nearly 23,000 students in district and charter schools throughout the county were considered homeless, according to the most recent figures compiled by the San Diego County Office of Education. The majority of those students are not on the street or in shelters, however. “The largest population of kids who are in our public schools and identified as homeless by the Department of Education are those who are doubled up, sharing places,” said Michelle Lustig, director of Foster Youth Services, Coordinating Program and Homeless Education Services for the County Office of Education. There are also many who do meet the more common definition of homelessness. In San Diego Unified, 705 students were identified as living in temporary shelters, and 137 were unsheltered in the 2015-16 school year. The district also had 5,620 students whose families had doubled-up in someone else’s home as a financial necessity, and 284 were living in hotels or motels. In all, San Diego Unified had 7,326 students classified as homeless, or 5.7 percent of its population. South Bay Union School District had 1,566 homeless students, about 21 percent of its overall population. Of those, 19 were in shelters and 5 were unsheltered. 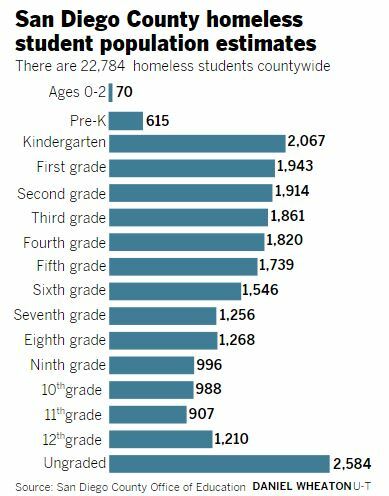 Escondido Union Elementary School District had 1,136 homeless students, representing 12.5 percent of its population. Of those, 33 were in shelters and 31 unsheltered. Vista Unified also had a high percent of homeless students,with 2,443 representing about 10 percent of its population. Of those, 68 were in shelters and 35 were unsheltered. The number of homeless students as defined by the U.S. Department of Education had grown sharply since the county first began counting homeless students as a requirement of the 1987 federal McKinney-Vento Homeless Education Assistance Act, although it has leveled off over the past few years and even dipped slightly this past year. Lustig acknowledged that the system for counting students is far from perfect. “You have to self-report, and that’s where the inconsistencies are,” she said about the methodology. In 2010-11, San Diego County had 15,826 homeless students. The number rose to 17,291 the next year and peaked at 23,294 in 2014. It was 22,784 in 2015-16, including 1,318 students in charter schools. The McKinney-Vento Homeless Education Assistance Act requires districts to count homeless students and provides funding to serve them through a competitive grant. There’s not a lot to go around. Only about 60 school districts in the state received McKinney-Vento subgrants in the most recent round of funding, with money ranging from $75,000 to $250,000 a year for districts with at least 5,000 homeless students. The San Diego County Office of Education was awarded a three-year grant of $250,000 a year and so far has received $500,000. Among the 42 districts in San Diego County, the grants also were awarded to San Diego Unified, Vista Unified and a coalition composed of Santee, La Mesa and Spring Valley school districts. The grants are competitive, and districts must show they have a population of homeless students and also have a plan for how they will use the money. Lustig said school districts may use their grant money to fill a variety of needs of homeless students, sometimes funding transportation, school uniforms, dental care, academic support, supplies, professional development, field trips, after-school care and other expenses. The County Office of Education uses its grant money for professional development, technical assistant, collection of data and a school-supply drive. Lustig said it also asks school districts what they need, and has helped pay for items such as shoes, backpacks and dental supplies. Susie Terry, a project specialist for foster youth at the San Diego County Office of Education, said her office has been working with districts to try to get better coordination about how homeless students are identified. Lustig said more money could be available for districts if there were better alignment between HUD’s and the Department of Education’s definition of homelessness. Still, she said there has been improvements in reporting over the years.